Some capital area events worth noting – over and above the omnibus budget debate – will follow in this and next week’s OttawaWatch pieces. 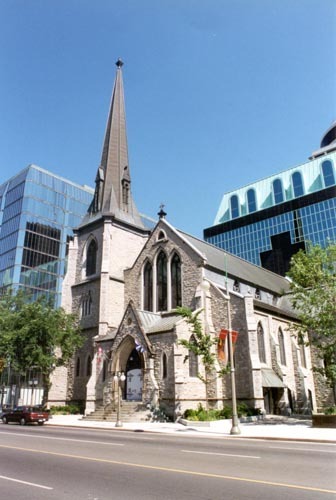 It is not too often that the church closest to Parliament Hill – and, as it happens, the church Edna and I attend – gets some ink in the mainstream media. Yesterday (Wednesday, June 14), a noon hour service especially for public servants wondering about their post-cutback job prospects, took place at St. Andrew’s Presbyterian Church. “It affects not just the individuals but the families and the community,” he said. “There’s a lot of anxiety, even anger,” he suggested. About 50 public servants attended the service, according to Metro, a free Ottawa daily newspaper. Music and inspirational readings were used to help attendees to forget about the stress of government layoffs. Sarah Lozowski, a civil servant and St. Andrew’s member, told Metro she came to be inspired. “The attitude in the public service right now is very uncertain and people are thinking they may lose their jobs. It was an opportunity to come and have a time of peace and reflection,” she said. St. Andrew’s has been around since 1828. It is located across from the Supreme Court and, more relevantly, perhaps, in the shadow of the Justice Building, where Edna’s office is located. Until six years ago, we attended a suburban church. But one day, Heather Willson, then the co-ordinator of a parliamentary staff resources seminar and graduate of Providence College, an evangelical school in Manitoba, told Edna, during a seminar break about the church she attended. We decided to give it a try. We had become used to attending downtown churches when we lived on the west coast. In addition we were naturally appreciative of great organ music, traditional hymns and Johnston’s biblical, relevant and thoughtful preaching. St. Andrew’s finds some interesting ways of reaching out, and this service was one such example. It has members and adherents coming from a variety of political, denominational, vocational and national backgrounds. Its Christian Development Director, Hulda Kandalaft, who joined the church staff in November, 2011, migrated from Syria with her husband and two children a decade ago. She comes from the part of that country which has seen much of the strife in recent months. Next week, I will have something to say about why I was not at the noon-hour service yesterday and will also try to describe what happened at two other meetings on the same day. I want to wrap today with just a brief comment about the marathon omnibus budget debate which has been going on since early this morning, June 14. There is considerable discussion about the level of democracy exhibited in debate time limits and omnibus bills. In the view of this humble scribe, the issue needs to go back to the nature of our adversarial system. It is quite ancient and takes little account of the potential for goodwill, collaboration and disciplined debate. It is in need of some considerable reform. Hopefully, last year’s filibuster over back-to-work legislation and the time consumed on this omnibus debate will help some of the brighter politicians to get some ideas about the potential for change.